Hydrofluorocarbons (HFCs), the refrigerant used in air conditioners, are a major source of greenhouse gases. When U.S. environmental experts sit down with their international counterparts Nov. 1-3 in Montreal, near the top of the agenda will be reducing the effects of gases used in air conditioning. That’s a potentially chilling topic in places — such as Las Vegas — that depend on air conditioning to maintain a climate that’s conducive to partying and gaming and just living. But experts say there is no cause for alarm. Change is coming, they said, but it will look like the gradual conversion to digital televisions. No sudden changeover requiring capital investment will be necessary. New chemistry and the normal replacement of equipment should solve the problem. On Oct. 15, the White House announced new administrative measures and private sector pledges to phase down the use of hydrofluorocarbons (HFCs), the refrigerant used in air conditioners, by the year 2025. HFCs are a major source of greenhouse gases that deplete the ozone layer and have a global warming potential (GWP), that is greater than carbon dioxide. The United States, European Union, China, Brazil, India and other countries are now working to amend the U.N. ozone treaty to phase out the production and use of HFCs by the year 2040. 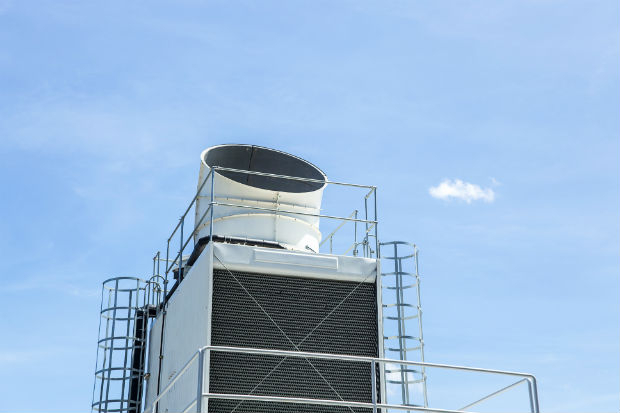 Among the private sector commitments, Ingersoll-Rand, which manufactures Trane air conditioners, said it would reduce refrigerant-related emissions from its products by 50 percent and operations emissions by 35 percent by 2020. How is this being accomplished, and what does it mean for businesses and residents that rely on air conditioning during the hot summer months? According to Scott Tew, executive director of the Ingersoll Rand Center for Energy Efficiency & Sustainability, the next generation of refrigerants are typically based on HFO (hydrofluoro olefin) and have 300 times less atmospheric lifetime and impact on global warming than the current HFC refrigerants, making them more climate-friendly. “In addition to incorporating next-generation, lower global warming potential refrigerants throughout the Ingersoll Rand HVAC and refrigeration portfolio, new technologies are being introduced that reduce the amount of refrigerant required, reduce leaks and increase product efficiencies. The combination of next-generation refrigerants and new technologies reduces the GHG of the products in aggregate making them exciting, viable long-term solutions,” said Tew. HFO-1234yf is a refrigerant that DuPont and Honeywell developed and manufacturing to meet a European Union directive to phase out refrigerants with greater than 150 global warming potential (GWP) in air-conditioning applications for new cars. DuPont is marketing a product based on HFO-1234yf under the name Opteon XP10 throughout Europe. In addition to the reduction of GWP, HFO-based refrigerants are nontoxic and nonflammable, a distinct advantage over other alternative refrigerants like ammonia and pentane that have been used in the past. According to Diane Picho, global business manager for DuPont Refrigerants, the new HFO-based refrigerants are a close match in performance properties to the HFC products and is very compatible with existing HFC-134a systems technology. “The new Opteon XP10 would provide an efficient transition to those types of equipment that are currently based on the 134a technology,” said Picho. Based on successful results in Europe, DuPont has plans to begin incorporating an Opteon product in the U.S. and is working with manufacturers such as Trane to develop new refrigeration systems of the future. Today, air conditioning units in the U.S. use HFC products such as R-123 and R-22. The further production of R-22 equipment ended in 2010 and the production of the R-22 refrigerant is scheduled to end in 2020 along with the production of R-123 equipment. Refrigerant R-123 production is scheduled to end in 2030. Similar to the transition from analogue to digital TV and incandescent to CFL and LED lighting, it is expected that most homeowners will make a seamless transition to saving energy and saving the planet from greenhouse gases. This assumption is based upon the life expectancy of most air-conditioning units of between 15 and 25 years, along with the development of both the new HFO refrigerants and more efficient A/C systems that are expected to become available in the next five years.